So here's one for you; try sitting in a chair and draw clockwise circles with your foot. Keep doing it while you then try to draw a counter clockwise circle in the air with your finger. The amazing results will astound! No that's not the game, but it is fun though. I learned that years ago. I don't know why I suddenly thought of it. Oh well. RULES: Everyone knows the standard "if you were a tree, what kind of a tree would you be?" question. But no one ever stops to ask what kind of a person that type of tree might be. I'll present you with the picture of a tree, and you tell me either what kind of a person it would be (i.e. Actor, thief, singer, construction worker, etc.) or if you think they would someone specific then the name. Simple as that. So if this tree were a person, who or what would it be? The picture is not coming up. Once in High School psych class the teacher asked us to draw a tree and then she analyzed them. 5 of us had the same tree and she said that we were very detailed oriented and creative, blah, blah, blah... the real reason, and we told her, was that we all were in the same elementary class and we taught how to draw trees! BTW, I was totally spinning my finger and toes - thank you. I would go with Michelle Trachtenberg...because she was on that show that had a character named Willow and that choice is too obvious. You know me. Just gotta shift things off to the side just a bit with anything I do. That we they all got to refocus and they can't immediately GETCHA. Oh and that finger/footy thing is the work of the devile. You, sir, are in league with da ebel. Yeah blogger was screwing up earlier, but the pictures seem to be popping back up. I am thinking that if this tree was a person it would be Miley Cyrus. Think about it. If the tree was a person, the poor person would have been standing there for a long time with no food, or Dr. Peppers. (Horrors!) So, yeah, dead. But if I stop being stupid, and messing up the game (sorry), I see the tree as Snuffleupagus. Shoot, that's not a person either. Played by Martin P. Robinson, but I have no idea what he looks like, so maybe I should just give up on this. No, wait. Hagrid. From Harry Potter. (The movie, not the book.) There. In fact, if you want me to be more specific, it looks like Hagrid twirling his foot and finger. Ooooh, I like this game!! I picture this tree being some tall, leggy model with long flowing hair!! Either that, or someone who's weepy all the time! Get it? 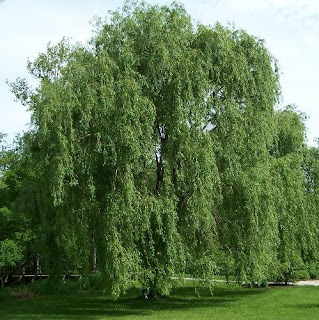 Weeping willow? Anybody? A large but elegant classical musician. Harpist? My wife sent me that foot/finger thing and while I was reading it to my staff at work they were trying it and laughing like mental patients! It is great. This tree would be someone with a dramatic personality - larger than life - Someone like Cher or Bette Midler perhaps. I can actually do the foot thing. I think it's because I play the piano and have to partition my two hands and one of my feet off in my head. Hmmm... that tree... looks like... the person behind the desk at the DMV. Lackadazical, defeated, sad. Grizzly Adams!!! C'mon, you can't see it?! No way!! Total Wookie wannabe! I think the tree reminds me of Cousin Itt from the Addams Family. I can do the foot-finger thing only if I am not chewing gum at the same time. #1 - It's direct. Willow, the little guy who fought with Val Kilmer.... That's the first thing I thought of.... I'm so renting that movie tonight.